It is my pleasure to publish these evocative pictures of the East End (with some occasionally facetious original captions) selected from the popular magazine Wonderful London edited by St John Adcock and produced by The Fleetway House in the nineteen-twenties. Most photographers were not credited – though many were distinguished talents of the day, including East End photographer William Whiffin (1879-1957). 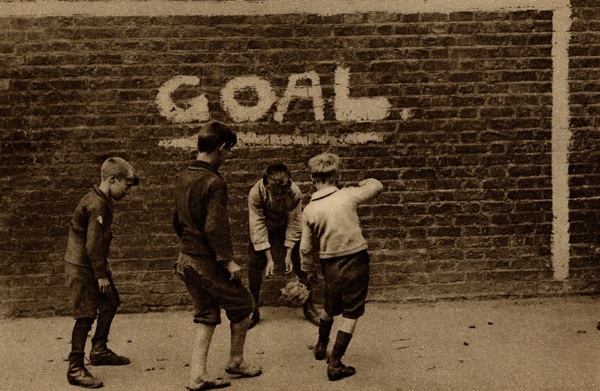 Boys are often seen without boots or stockings, and football barefoot under such conditions has grave risks from glass or old tin cans, but there are many urchins who would rather run about barefoot. 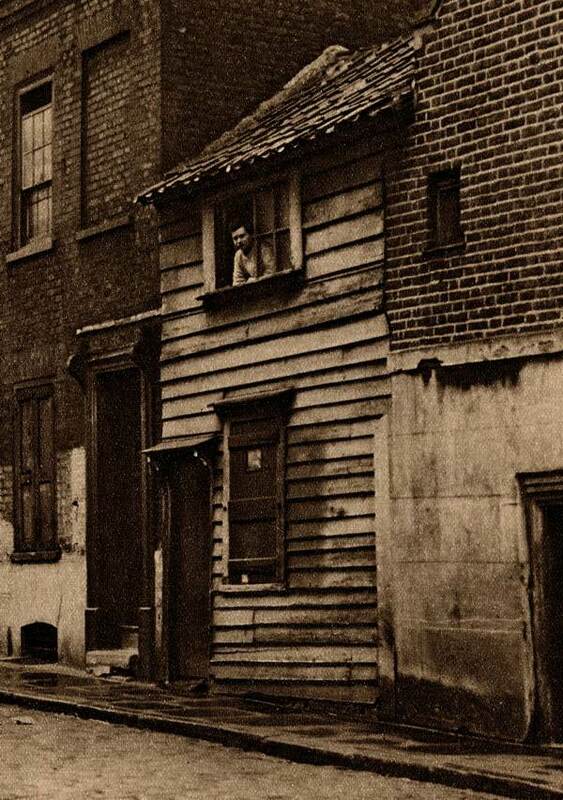 When this narrow little dwelling in St John’s Hill, Shadwell, was first built in 1753, its inhabitants could walk in a few minutes to the meadows round Stepney or, venture further afield, to hear the cuckoo in the orchards of Poplar. 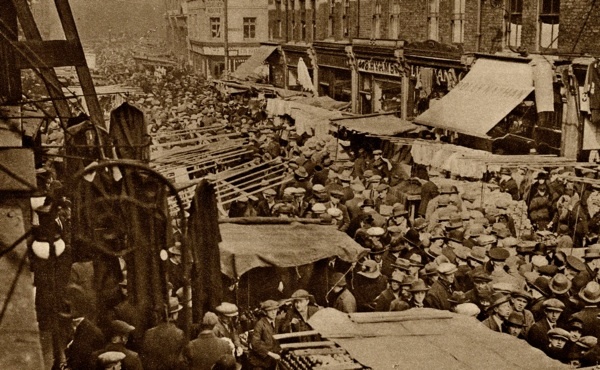 Middlesex St is still known by its old name of Petticoat Lane. Some of the goods on offer at amazingly low prices on a Sunday morning are not above suspicion of being stolen, and you may buy a watch at one end of the street and see it for sale again by the time you reach reach the other. A vanished theatre on the borders of Hoxton, just before demolition, photographed by William Whiffin. 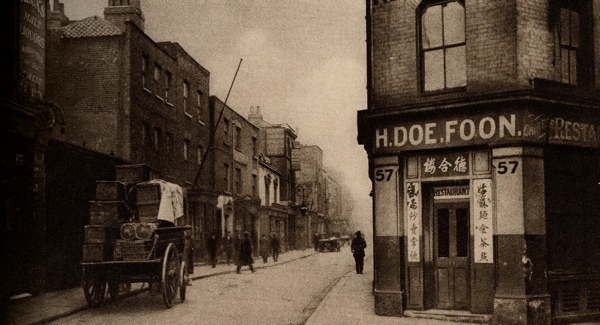 In 1838, a tea garden by the name of ‘the Eagle Tavern’ was put up in Shepherdess Walk in the City Rd near the ‘Shepherd & Shepherdess,’ a similar establishment founded at the beginning of the same century. Melodramas such as ‘The Lights ‘O London’ and entertainments like ‘The Secrets of the Harem,’ were also given. In 1882, General Booth turned the place into a Meeting Hall for his Salvation Army. There is little suggestion of the pastoral about Shepherdess Walk now. 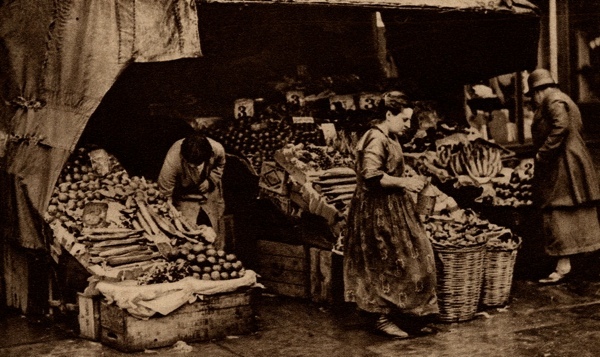 In the East End and all over the poorer parts of London, a strange kind of establishment, half booth, half shop, is common and particularly popular with greengrocers. Old packing cases are the foundation of a slope of fruit which begins unpleasantly near the level of the pavement and ends in the recess behind the dingy awning. At night, the buttresses of vegetables are withdrawn into shelter. 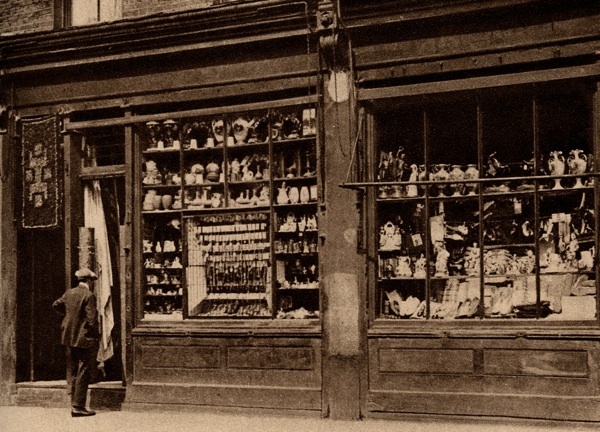 Old shop front in Bow photographed by William Whiffin. 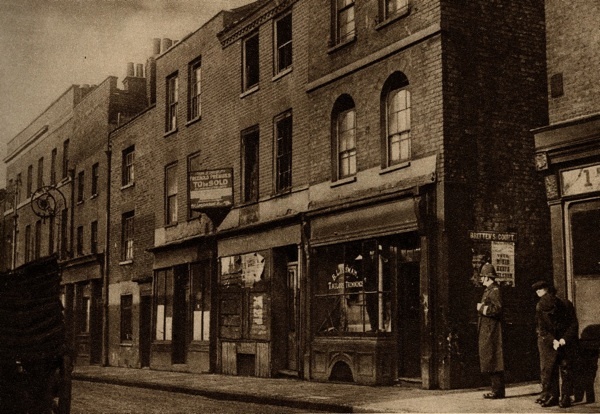 Pawnbroking, once as decorous as banking, has fallen from the high estate in the vicinity of Lombard St. Now, combined instead with the sale of secondhand jewellery, furniture and hundred other commodities, it is apt to seek the corners of the meaner streets. 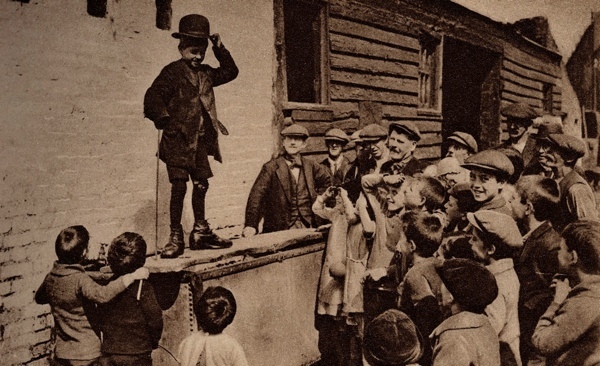 A water tank covered by a plank in a backyard among the slums is an unlikely place for a stage, but an undaunted admirer of that great Cockney humorist, Charlie Chaplin, is holding his audience with an imitation of the well-known gestures with which the famous comic actor indicates the care-free-though-down-and-out view of life which he has immortalised. An old charity school for girl and boy down at Wapping founded in 1704. The present building dates from 1760 and the school is supported by voluntary subscriptions. The school provided for the ‘putting out of apprentices’ and for clothing the pupils. The hunt for bargains in Shoreditch. A glamour surrounds the rickety coster’s barrow which supports a few dozens of books. 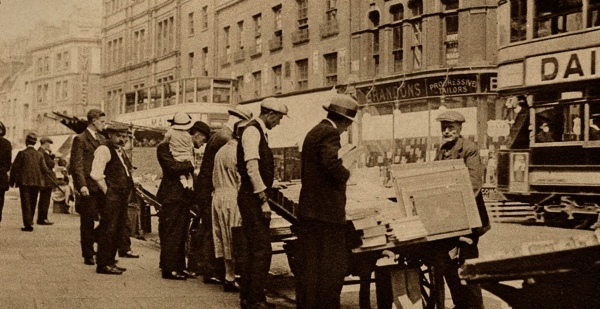 But, to tell the truth, the organisation of the big shops is now so efficient that the chances of finding anything good at these open air book markets may have long odds laid against it. 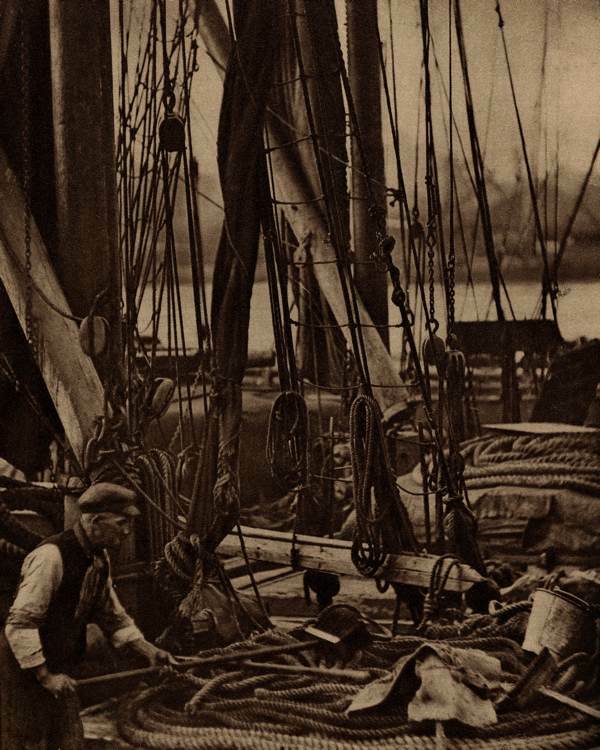 The landsman’s conception of a sailing vessel, with all its complex of standing and running rigging that serves mast and sail with ordered efficiency, is apt for a shock when he sees a Thames barge by a dockside. The endless coils and loops of rope of different thickness, the length of chain and the litter of brooms, buckets, fenders and pieces of canvas, seem to be in the most insuperable confusion. Gloom and grime in Chinatown. Pennyfields runs from West India Dock Rd to Poplar High St. A Chinese restaurant on the corner and a few Chinese and European clothes are all that is to be seen in the daytime. The gem of Cornhill, Birches, where it stood for two hundred years. 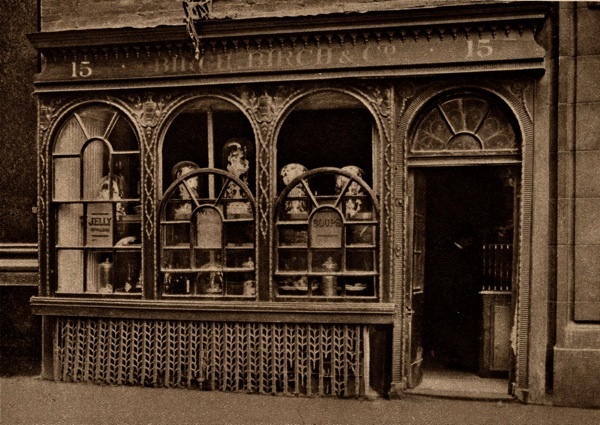 Towards the end of the eighteenth century, the brothers Adam erected its beautiful shop front. Within were old bills of fare printed on satin, a silver tureen fashioned to the likeness of a turtle and many other curious odd-flavoured things. Birches have catered for the inspired feasting of the City Companies and Guilds for two centuries but now this shop has moved to Old Broad St and, instead of Adam, we are to have Art Nouveau ferro-concrete. 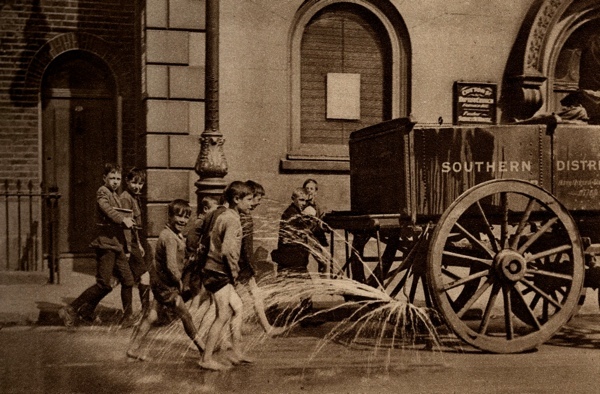 It is doubtful if the Borough Council of Poplar had any notion, when they supplied the district with water carts, that the supplementary use pictured in this photograph by William Whiffin would be made of them. Given a complacent driver, there is no reason why these children should not go on for miles. 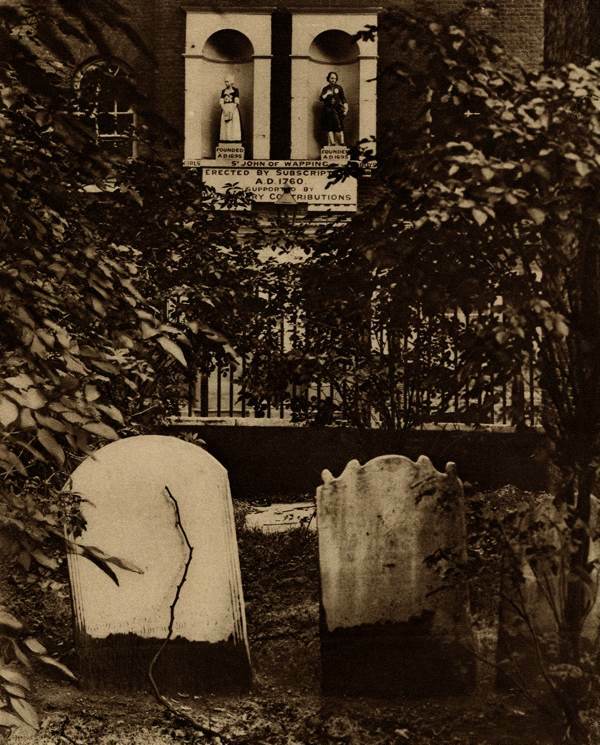 Grime and gloom in St George’s St photographed by William Whiffin. St George’s St used to be the famous Ratcliff Highway and runs from East Smithfield to Shadwell High St. It is a maritime street and contains various establishments, religious and otherwise, which cater for the sailor. River Lea at Bow Bridge photographed by William Whiffin. 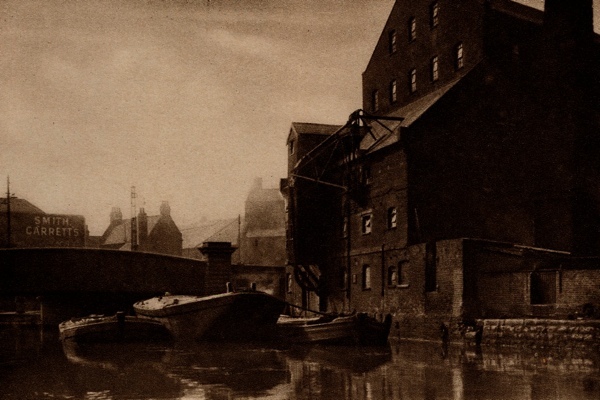 On the right are Bow flour mills, while to the left, beyond the bridge, a large brewery is seen. 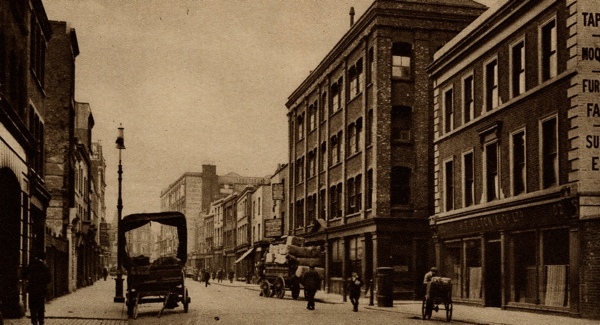 A view of Curtain Rd photographed by William Whiffin, famed for its cabinet makers. It runs from Worship St – a turning to the left when walking along Norton Folgate towards Shoreditch High St – to Old St. Curtain Rd got its name from a curtain wall, once part of the outworks of the city’s fortifications. Fish porters of Billingsgate gathered around consignments lately arrived from the coast. At one time, smacks brought all the fish sold in the market and were unloaded at Billingsgate Wharf, said to be the oldest in London. 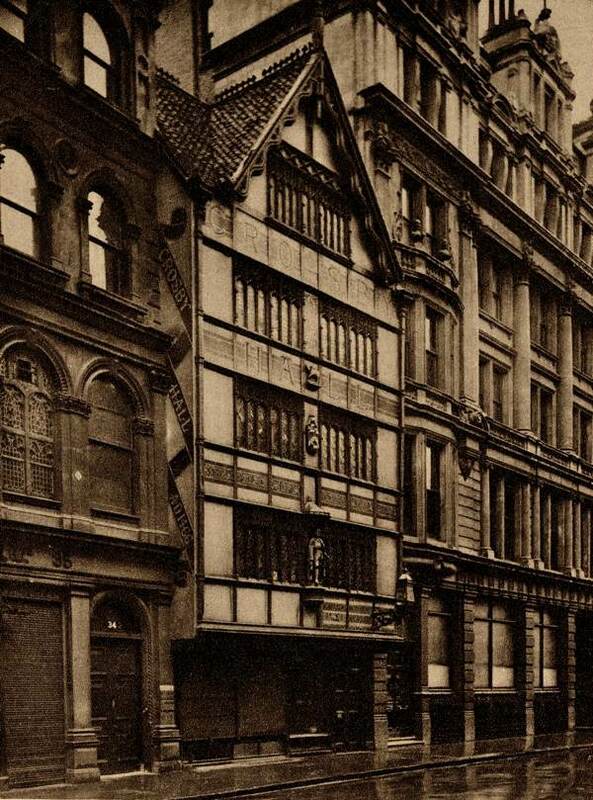 Crosby Hall as it stood in Bishopsgate. Alderman Sir John Crosby, a wealthy grocer, got the lease of some ground off Bishopsgate in 1466 from Alice Ashfield, Prioress of St Helen’s, at a rent of eleven pounds, six shillings and eightpence per annum, and built Crosby Hall there. 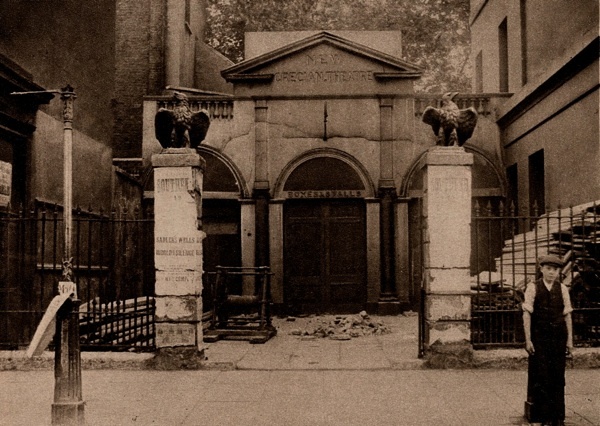 It came into the possession of Sir Thomas More around 1518 and by 1638 it was in the hands of the East India Company, but in 1910 it was taken down and re-erected in Cheyne Walk. 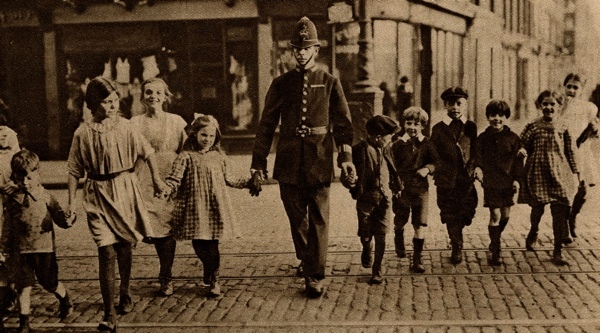 Whatever their relations with the Constable may come to be in later life, the children of the East End, in their early days, are quite willing to use his protection at wide street crossings. There is no more important work in the great cities than the amelioration of the slum child’s lot. 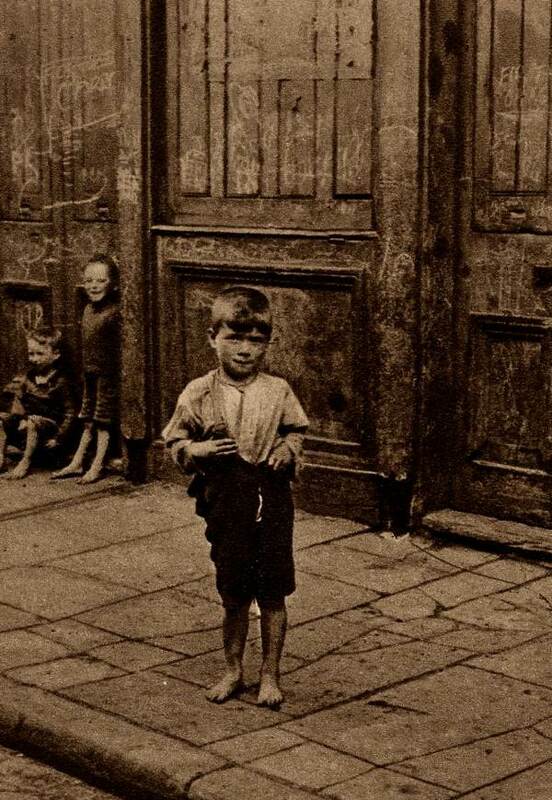 Many East End children have never been beyond their own disease-ridden courts and dingy streets that form their playground. The words here speak louder than the pictures for me. Very glad that tone is not the prevailing one any more, though I know that patronising attitude is alive and well for many authorities dealing with London’s poor and disenfranchised. (watched ‘The Hard Stop’ last week, about the Mark Duggan murder). like sardines. People were glad to get out of their tiny slum dwellings where up to 20 people could share one room, so now we know where they used visit. So much to view in these photos, I am going back for a 3rd look and probably a 4th and a 5th. It is so good to see pictures, I will look out for more by William Whiffin, my mission for today and for the Wonderful London. Not so wonderful. But an astonishing collection saying so much with so much feeling waiting to be explored. Such a shame it is all gone now with only glass monstrosities covering over it’s past ghosts. 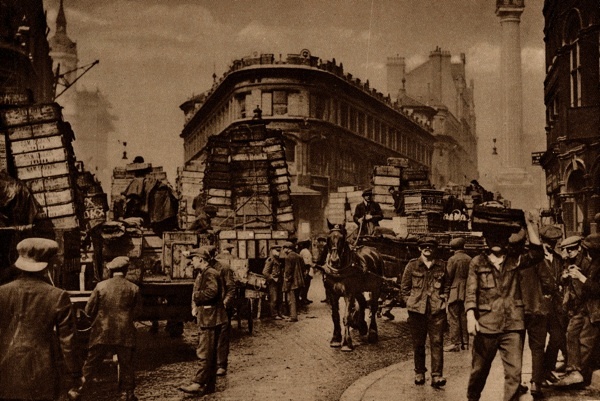 How our wonderful London has changed. What stories are hidden deep within, if only we could hear the echoes of those times past. Made my morning. Good to see the reference to the famous Eagle from Pop Goes the Weasel. I agree with Caroline about the semi-patronising tone. A bit like those wartime news reels. 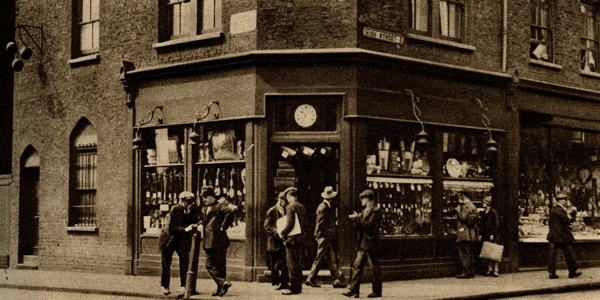 The pawnbroker photo shows the shop on the corner of Preston’s Road (left) and Poplar High Street (right), formerly named simply High St. Thanks again for another glimpse into the fascinating past of dear old London where I lived for a while in the 1970′s.